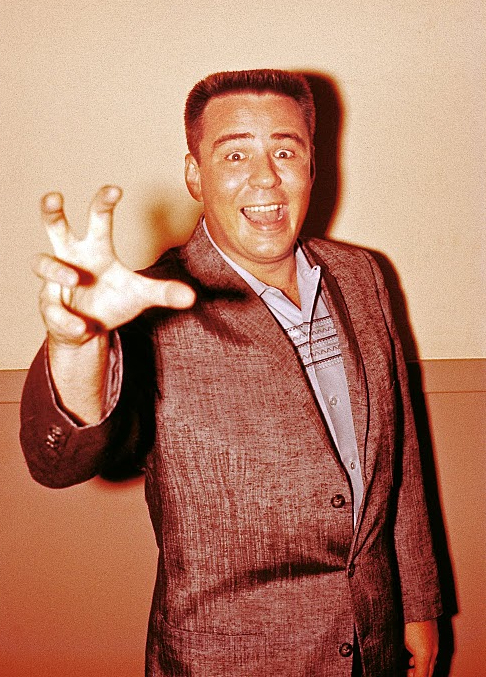 On February 26, 1955, a Cleveland deejay named Tommy Edwards became the first music promoter to book a Southern singing sensation named Elvis Presley north of the Mason-Dixon line. The event was the Hillbilly Jamboree at Cleveland’s Circle Theater. That fall, Edwards brought Presley back to the Cleveland area for several more shows, including one on October 20, 1955, at Brooklyn High School. On that date, Pat Boone was the headliner (“Ain’t That a Shame” was his big hit), with Elvis, Priscilla Wright, the Four Lads, and Bill Haley’s Comets rounding out the bill. At some point during the proceedings, Edwards snapped a now iconic color photo of Haley and Presley shaking hands (above). Haley’s 1954 cover of “Rock Around the Clock” was one of the genre’s first monster hits. 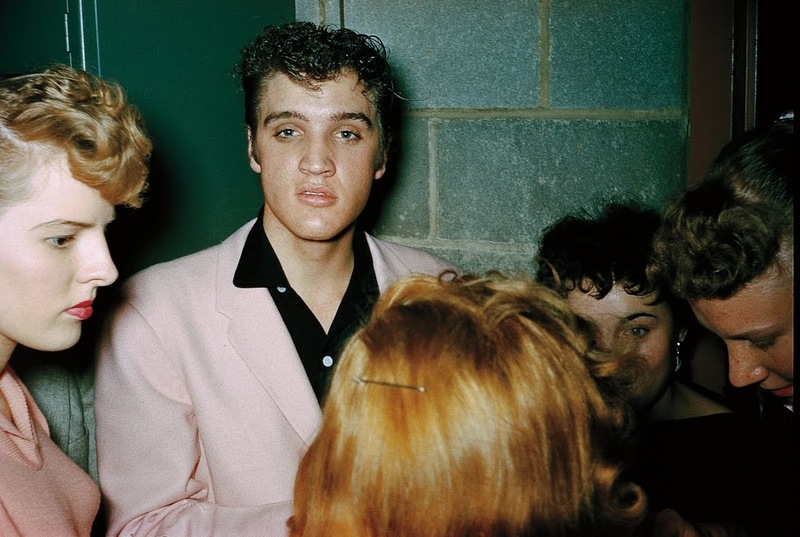 He was the established star while Presley was still the young upstart, but in Edwards’s photo, the bow-tied Haley resembles someone’s doughy uncle compared to Presley, who looks like the sort of boy you’d definitely want to keep your daughter away from. By 1956, Edwards was showing this and his other color Ektachrome slides at the dances he promoted around town. While a slideshow may sound dull to 2011 ears, in 1956 there was no Facebook, television was black and white, and the exposure given to pop music by the mainstream press was downright stingy. For some of the kids dancing the night away in their local high-school gymnasium, a 12-foot-high blowup of Elvis Presley was as close as they would ever get to the future King. According to Christopher Kennedy, author of “1950s Radio in Color: The Lost Photographs of Deejay Tommy Edwards,” Edwards did not set out to document a defining decade in rock ’n’ roll. But he was a budding documentary photographer, one with unusually good access. Between the summers of 1955 and 1960, Edwards took photos of just about every musician and movie star who passed through the studios of AM radio station WERE where he worked. His camera was a Kodak Pony. 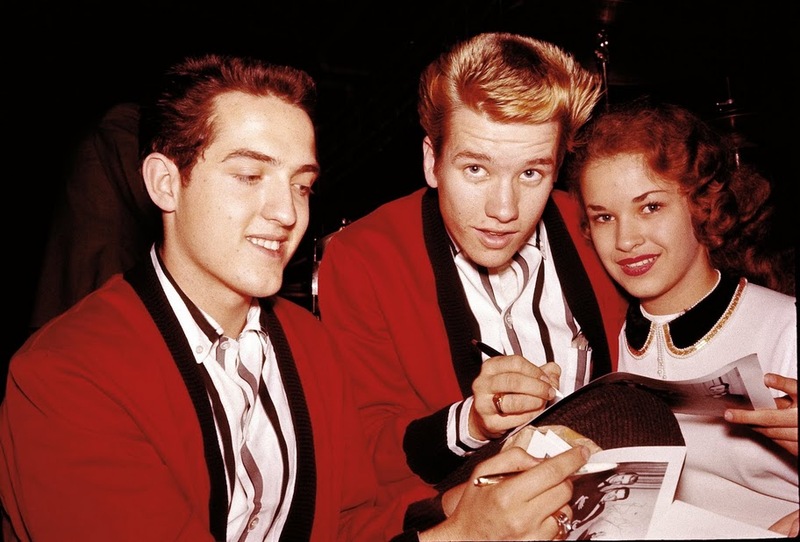 Singer Arlene Fontana, seen here in May, 1958, is one of numerous “hopeful unknowns” in Kennedy’s new book. 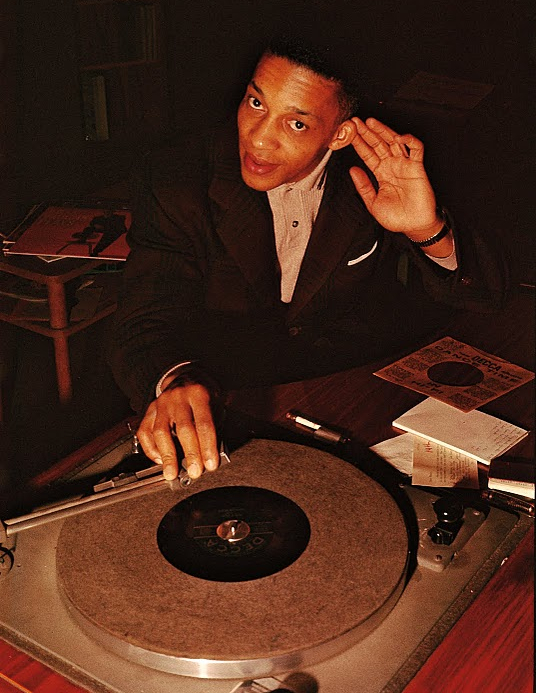 Malcolm Dodds, seen here at WERE studios in January, 1959, represents a link between Sam Cooke and Marvin Gaye. The book’s narrative tells this story via Kennedy’s scene-setting sketches of each artist, supplemented by interviews the writer conducted with as many of the subjects as he could speak to who were still living. These nuggets are salted with excerpts from a 1981 radio interview with Edwards just before his death (in one juicy passage, Edwards recounts the day he all but caught Elvis with his pants down after a romp with a couple of teenage girls), as well as snippets culled from Edwards’s two-page, self-published weekly newsletter, which proved an invaluable companion to the 1,800 or so slides Kennedy borrowed from the deejay’s nephew. 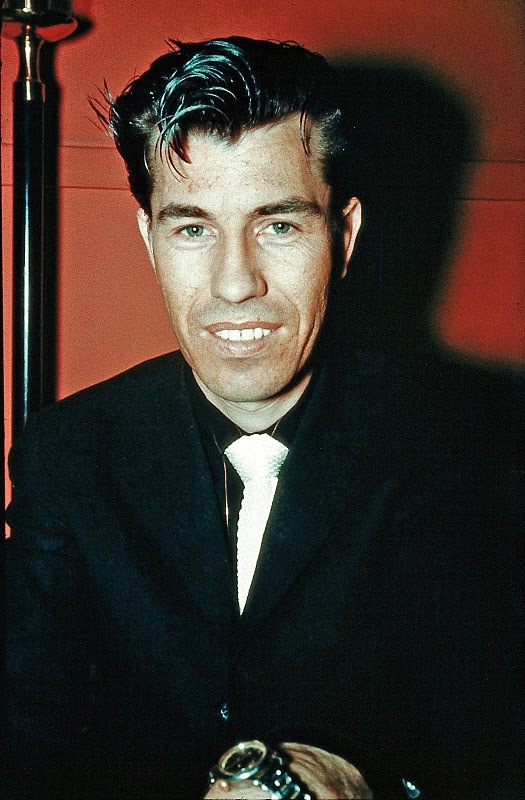 In April of 1958, “rock ‘n’ roll gangster” guitarist Link Wray was making music that would influence everyone from Pete Townsend to Jimi Hendrix. Hollywood is also well represented (Clark Gable, Charleton Heston, Jayne Mansfield, Doris Day, to name but a few), so much so that at one point Kennedy wondered if the book should be organized thematically. But in the end, the chronological approach won. “That felt better to me,” he says, “because then you really get a feel for what a hodgepodge era the 1950s had been.” On page 103, for example, there’s a photo of a pensive Henry Fonda sitting before a WERE microphone during a 1957 publicity tour for “Twelve Angry Men.” Turn the page and there’s country singer Wanda Jackson at age 19 in a rose-colored velvet dress that her mom made her. Edwards captured it all. 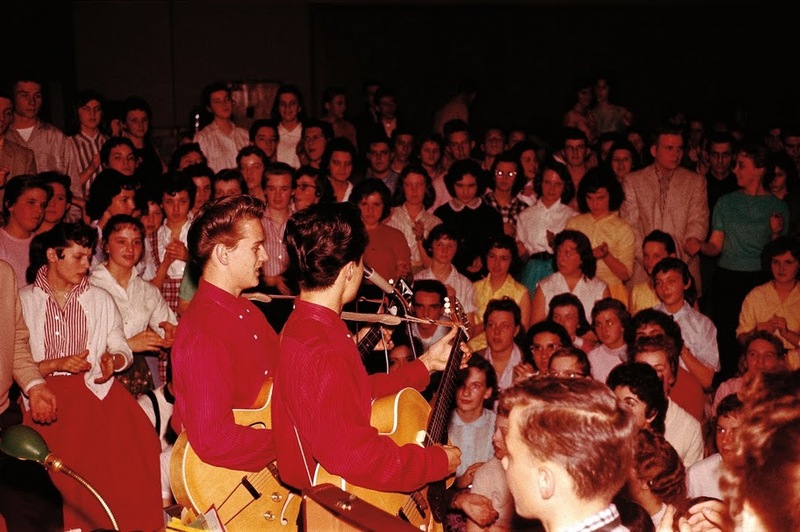 Glenn and Jerry, playing a Tommy Edwards deejayed dance in March of 1959. Admission was around 35 cents. Edwards, too, got lost in the shuffle. By 1959 he had lost his gig at WERE, and he put down his camera in the middle of 1960 before spending the rest of that decade and part the next in the relative obscurity of running a record store. But Edwards had witnessed the beginning of something great, and he used his camera and perch behind a microphone to make it even greater. Thanks to Kennedy, who tracked down his photos and pieced together the Cleveland deejay’s story, the role Edwards played will not fade away. My happy days also!! The hairstyles that took a long time to accomplish and lots of Brylcream for the guys, ponytails for us girls. Elvis just starting out. Music you could sing and dance to. Now I tell my great grandchildren and they look at me like I’m weird. The 50’s were my life, best years in the world. 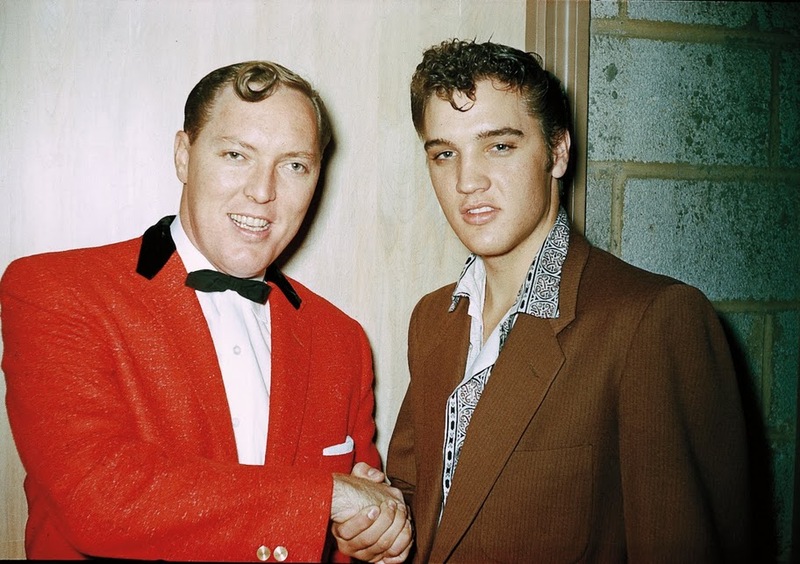 Bill Haley was SO cool and was born to have top hit records. I still miss him. He had what it took. Then Elvis came thru with hits like thunder and lightening. His first hit record, Heartbreak Hotel, I heard from in a car with my then boyfriend waiting to go inside to my Central Catholic High School as just a freshman. We always listened to car radios for HOT rock ‘n’ roll. And love songs like Ms. Kittie Kalen sang. “ ” I’d go to these dark, acid parties, and there would be my pops.